BÌNH ĐỊNH — Bình Định Province’s Hoài Nhơn District functional forces began investigating the fire on three boats at Tam Quan mooring area on Thursday. 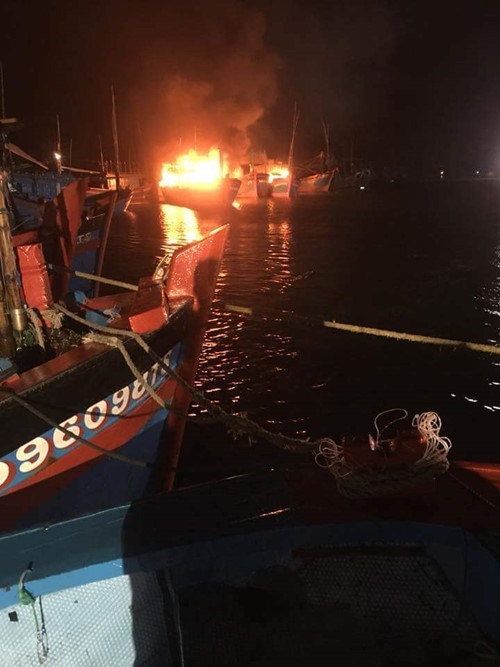 At 10.30pm on Wednesday, a patrol team of the Tam Quan Nam border guard force detected three fishing boats on fire. The boats are owned by Trần Tiến Thành from Tam Quan Bắc Commune’s Tần Thành 1 Ward, Trần Chín from Tam Quan Bắc Commune’s Thiện Chánh 1 and Võ Ngọc Đô from Hoài Hải Commnue’s Kim Giao Trung. The patrol team and residents tried to put out the fire and called the firefighting force. Four fire trucks with 50 firefighters were mobilised to control the fire. At 3.30am on Thursday, the fire was extinguished, however, all the cabins and fishing gear were destroyed.